ST. CLAIR SHORES, Mich.- With dreams of warmer weather in the near future, we've started to think spring. Which means spring cleaning has appeared on our to-do list, and by spring cleaning we mean for the car. But instead of trying to clean up the mess that winter made all at once, get your vehicle ready for spring with our easy Spring Car Car Tips that each take only 10 minutes or less! When it comes to Spring Car Care Tips, we're keening it simple. Try one at a time and your vehicle will be squeaky clean in no time! -Next time you go out to the car, bring a bag and throw away any garbage or things you don't need. -Clean the mats. Take your mats out next time you get out of the car. Wash them off and then hang them to dry so they're ready to go next time you get in the car. 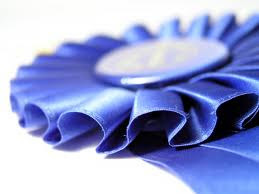 -Keep dust away year round by adding a microfiber cloth to your glove box. Whenever you notice it getting dusty, just grab the cloth and wipe it off. -Wash the windows inside and out. Cleaning off that dusty film on the windshield and the fingerprints in the back seat will increase your visibility. -Wash the car. If it's too cold to wash it yourself, go to the car wash and ask for a wash that includes the undercarriage so you can get rid of all the salt from winter and prevent corrosion. -Vacuum it out. If it's a hassle to get the vacuum out to the car, stop by the do-it-yourself car wash next time your out and use the high-powered vacuum. -Do a windshield wiper check. Michigan's harsh winter conditions can take a toll on your wipers. Make sure they aren't streaking or cracked, otherwise it's time to replace them. -Do a tire check. As the temperature changes make sure your tires are properly inflated and as while you're at it make sure they have adequate tread. Since we're pretty sure you don't want to spend the whole day cleaning your vehicle, keep these Spring Car Care Tips in mind and in less than 10 minutes a day, you'll be ready to cruise into warmer weather! If spring cleaning isn't your thing we'd be happy to help you out. Just bring your car by your Roseville Area Ford Dealer and our Service Center will take care of you! Family owned and operated since 1946, Roy O'Brien Ford is located at 22201 E. 9 Mile Rd. St. Clair Shores, MI 48080 for all your Metro Detroit Vehicle needs. Stay on the right track to Nine Mile and Mack! ST. CLAIR SHORES, Mich.- It's time to look for the pot of gold at the end of the rainbow, this weekend is St. Patrick's Day! Who says you can't celebrate even if you're not Irish? So bust out all of the green in your closet and get in the spirit! These Easy St. Patrick's Day Snacks are just the thing to get you excited, so check out your Roseville Area Ford Dealership's ideas! Puppy chow and thin mints, two delicious treats that no one can turn down. And combining the two makes it even better! 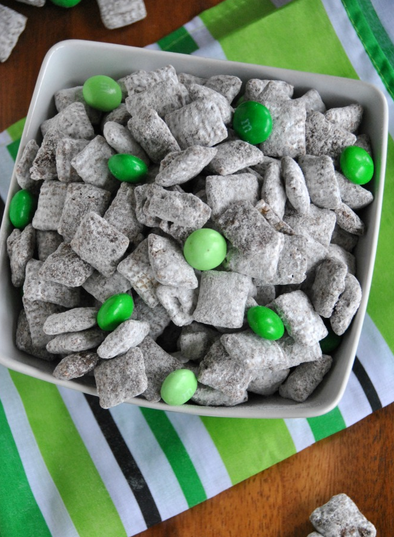 You can make this Thin Mint Puppy Chow for your St. Patrick's Day celebration, or just to have around the house this weekend! Trust us, no one will be complaining. Want another tasty treat that everyone will love, break out the Oreos. This St. Patrick's Day Snack doesn't get any easier! All you have to do is melt some chocolate bark or candy melts and then dip the Mint Oreos in it. Add some festive green sprinkles and you're done! These are great for both kids and adults! If you're looking for a healthier option, or a snack that can be used as an appetizer, these Shamrock Chips are perfect! 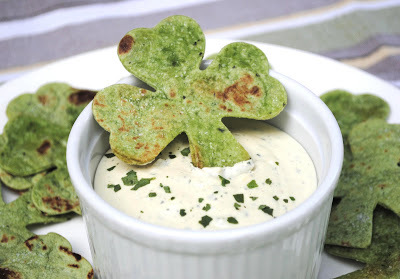 This St. Patrick's Day Snack is festive and extremely easy! Grab a cookie cutter and cut shamrock shapes out of a spinach tortilla. After you spray them with cooking oil, sprinkle with salt and then they're done baking in less than 10 minutes! If you don't want to go out of your way to get in the St. Patty's Day spirit, make pasta for dinner. 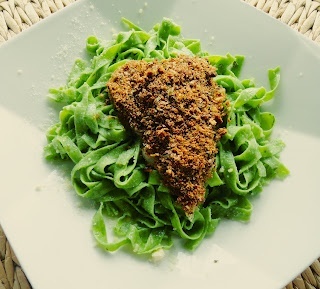 Make it St. Patrick's Day style just by adding some green food coloring to the water before you cook the pasta! This is sure to be a hit with the kids, and it doesn't take any extra time. With St. Patrick's Day this weekend, we've got Spring on the mind. If you need to upgrade your vehicle before the flowers start to bloom, consider our Ford Escape A Plan and X Plan Pricing that will save you some green! Family owned and operated since 1946, Roy O'Brien Ford is located at 22201 E. 9 Mile Rd. St. Clair Shores, MI 48080 for all your Metro Detroit Ford Vehicle needs. Stay on the right track to Nine Mile and Mack! Rendering of the 2015 Ford Mustang. ST. CLAIR SHORES, Mich.- Rumors regarding the all new 2015 Ford Mustang have been floating around the web, but no real facts about what the new 'Stang will look like or offer have been confirmed. However, it looks like there may have been a breakthrough this afternoon! Recently, it has been reported that the next generation would bring a Turbocharged Four-Cylinder 2015 Ford Mustang, just not to the U.S., but it looks like that has changed! It appears that the 2015 Ford Mustang with Turbocharged Four-Cylinder Engine is in fact coming to the United States. The new 2.3-liter engine would most likely offer about 300 horsepower which is close to the current V6 model. However, we could see a higher power output since the next generation pony is thought to be a step up from the current base model. While the current Ford Mustang already offers and impressive 19/31 mpg, the new turbocharged engine's low-rpm torque and greater efficiency could offer improved fuel economy. Better fuel economy may also stem from a little weight loss from the current Mustang's 3,500 pound weight. So while we still haven't received any information on exact looks or specifications for the 2015 Ford Mustang, we've made some progress discovering that the Turbocharged Four-Cylinder 2015 Ford Mustang may actually be coming to the U.S. If you just can't wait, check out our 2013 Ford Mustang Brochure and save a little green with our Ford Mustang Rebates! Family owned and operated since 1946, Roy O'Brien Ford is located at 22201 E. 9 Mile Rd. St. Clair Shores, MI 48080 for all your Metro Detroit Ford Vehicle needs. Stay on the right track to Nine Mile and Mack! ST. CLAIR SHORES, Mich.- Do you enjoy streaming music through the Spotify app? Well your in car music experience is about to get even better. Spotify, the leading music streaming service, providing listeners with access to over 20 million songs, will soon be available in vehicles equipped with Ford SYNC AppLink! Voice-activated music streaming will soon be possible with the Ford SYNC AppLink and Spotify Partnership. With more than 20 million active users all over the globe, 5 million of Spotify's users pay for premium memberships. Coupled with the more than one million Ford vehicles in North America that are equipped with Ford SYNC AppLink, more drivers will be able to access hands-free, voice-activated entertainment while driving. Ford drivers who have their iPhone paired with their vehicle's Ford SYNC AppLink system will have access to more than 20 million songs and playlists while keeping their attention on the road. Spotify Premium subscribers who have the app running on their SYNC-connected iPhone will be able to access the following features from their Ford SYNC AppLink equipped vehicle, all with simple voice commands: Now Playing, Star/Unstar Track, Add Track to your "Road Trip" Playlist, Choose Playlist, Play Starred, Play Music, Similar Music, Recently Played, Start Album/Artist/Track Radio, Shuffle On/Off, Repeat On/Off, Skip Track Forward/Back, Play/Pause, Built In Social Sharing Capabilities, and Program the preset number keys so they work like a radio and save the currently playing album, artist or playlist to that number for easy access. The partnership, which has been in the works for a year and a half, is Spotify's first collaboration with an automotive manufacturer. More drivers will soon be able to Stream Music with Spotify and Ford SYNC AppLink as Ford will be the first automaker to launch Spotify In The Car. Although a date has not yet been confirmed when the update to the app will be available. If you have any questions about how to pair your smartphone, or how to use the Ford SYNC infotainment system, we's be happy to help! Give us a call or stop by! Family owned and operated since 1946, Roy O'Brien Ford is located at 22201 E. 9 Mile Rd. St. Clair Shores, MI 48080 for all your Metro Detroit Ford Vehicle needs. Stay on the right track to Nine Mile and Mack! ST. CLAIR SHORES, Mich.- A few months ago the Ford Atlas concept truck debuted at the Detroit Auto Show. Some felt it may have been our first glimpse at the next generation Ford F-150. Well, you can't quite tell if it is indeed the Atlas, but what's believed to be the 2015 Ford F-150 has been spotted while out testing! The 2015 Ford F-150 Sneak Peek doesn't exactly reveal every detail, but we do notice a few shocking details. 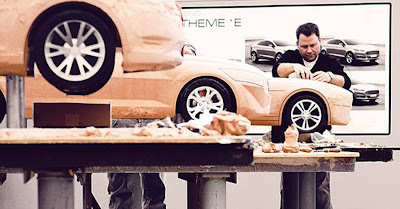 It's obvious that the next generation F-150 is still in early development. However, the spy shots reveal that it retains the chrome Gillette-style front grille present on the current F-150. 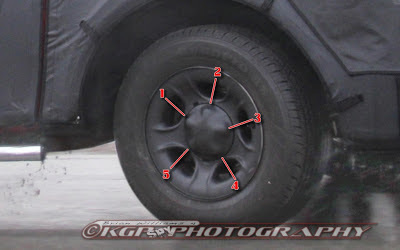 The most notable detail that stands out in these photos is that there are only five-lug wheel hubs which means that this could be a prototype for a lighter duty pickup truck like the Ford F-100. Trucks with higher payload ratings, like the current Ford F-150 usually have six or seven-lug hubs. Thanks to advanced metals, the 2015 Ford F-150 will be 700 pounds lighter and will enjoy improved fuel economy. This also offers the option for a smaller engine which is encouraged by the tiny split exhaust tips. Current Ford trucks have larger exhausts. Gas mileage is increased even further by the significant improvements in aerodynamics on the next generation Ford truck. Stay tuned for more 2015 Ford F-150 Sneak Peeks! But until more information is released, check out the 2013 Ford F-150 Brochure and remember that we can help you save with Ford F-150 Rebates! Family owned and operated since 1946, Roy O'Brien Ford is located at 22201 E. 9 Mile Rd. St. Clair Shores, MI 48080 for all your Metro Detroit Ford Vehicle needs. Stay on the right track to Nine Mile and Mack!